The history of the Mysore Pak dates back to 17 or the 18th century having its origin from Mysore in the state of Karnataka. 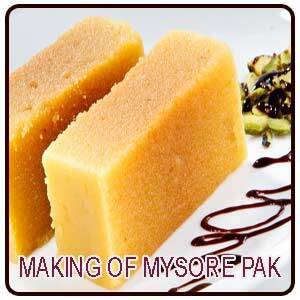 Mysore Pak is a mouth watering sweet dish of India made with roasted gram flour and clarified butter which gives the aroma and taste to the sweet. The Mysore Pak is more of a traditional South Indian sweet which can never mess out the menu on special occasions and at the time of festivals. History states that this sweet was first created in the Kitchens of the Mysore Palace then reigned by Mummadi Krishnaraja Wodeyar. One day the head cook named Kakasura Madappa simply made a concoction of besan, ghee and sugar which gave the look of gleaming Gold in the colloid form and dripping with ghee. The sweet that was formed delighted the royalties so much that it became a "Royal Sweet" and when the king asked the name of the sweet Madappa didn't have a name and so he called it as Mysore Pak. A delicacy from Mysore Palace,where Pak or Pakka in Kannada denoted the sugar syrup and also a dish resembling to nalapaka and bhimapaka.The King who relished the sweet very much asked Madappa to open a shop outside the palace premises so that the sweet is also available to the common people. Mysore Pak is a very popular dish during the Dussehra festival which brings guests from different fields like art and music to the palace. The Dussehra festival goes on for several weeks and includes parades, concerts, and general celebrations. Vendors peddle Mysore pak along with other Indian desserts and dishes where there will be a great demand for Mysore Pak due to its cooked nature, solidity and can be easily transported and no refrigeration is required. On days of festivals and occasions people prepare Mysore Pak and share it with friends and other family members. In ancient days this sweet used to have a special place in everyday cooking. It is not only loved by the natives of India but also by the Indians living abroad. Mysore Pak is more of a comfort food. Thus we should all be grateful to the blessed soul Kaakasura Madappa who was created by God to invent this sweet. 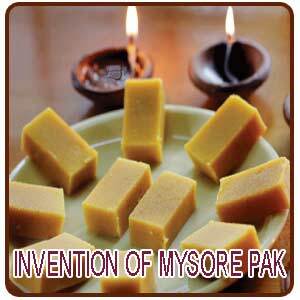 As it was mentioned earlier the accidental invention of Mysore Pak has never disappointed the people who tasted it. Since then Madappa family is into the making of Mysore Pak and maintaining the legacy. The immediate or the first generation of Maddappa long ago started a shop in Asoka road in Mysore which was then moved to Sayyaji Road in 1954 by Maddappa's grandson Basawanna in the year 1954.Now in fact the shop is run by the fourth generation and getting ready to be taken over by the fifth generation. The family still lives in the same house in which their ancestors lived, a twelve bedroom house given by the King for those who worked for him. The daughter- in- law of Madappa is the eldest member of the family now. The sweets are prepared in their house and then taken to the shop. The main ingredient of the Mysore Pak - the clarified butter is got from the nearby villages which makes the sweet taste great. They don't maintain any secret recipe for it is open and the main ingredients include gram flour, sugar, ghee, turmeric and cardamom. There is no wholesale dealing happening in the shop for it is sold only at retail prices and also don't have any other branch and retailers. At the time of invention of Mysore Pak it was not sold in pieces like today for it used to be just made into equal lumps and sold which would approximately weigh about 300 to 350gms and 1kg would cost only 3 rupees years back. But now it costs around Rs240 for one Kg of genuine Mysore Pak.Mysore Pak does not need any refrigeration and can be preserved for 2-3 weeks. The art related to bamboo and cane products is the most comprehensive of all the crafts practiced by most of the people of Assam. It is mostly practiced as a household job and for extensive household needs. The cane industry has found a high place among the handicrafts of the North Eastern States. Both full and part time employment is provided by the state government where skilled artisans produce decorative baskets, furniture and mats on a commercial basis. The cane products though are mostly available in natural color give a very trendy look and is recognized for its durability, low weight, easy maintenance and eco-friendliness. The cane craft in Assam is practised by a wide range of the peasant group irrespective of caste and community. Caning is the process or craft of weaving furniture and other cane related products. Cane furniture of India is very famous across the globe. Cane furniture is not very heavy and is very compact so that it is easy to be moved and kept anywhere in the house. The main ingredients required for the preparation of Mysore Pak are gram flour, sugar, clarified butter, refined oil and cardamom powder. A utensil with a heavy bottom is taken and the sugar and water is added and keep stirring continuously till the sugar melts completely. Now the gram flour is taken in another utensil and half the quantity of the refined oil taken is added to this and made into a batter. The ghee is taken in a separate pan and heated so that it melts. After ghee melts add rest of the oil as well. Check the syrup, for this take 1 drop of syrup and place it in a bowl. With the help of forefinger and thumb stick the syrup- if it forms one thread, sugar syrup is ready. The gram flour is added to the syrup and is to be stirred continuously. Care should be taken that the batter should not be sticking to the pan. A small quantity of ghee is added to the gram flour batter in the pan. Keep roasting and stirring continuously. The flame is kept in medium low and the ghee is added little by little to the batter with the help of a spoon. The indication that the gram flour is ready to become a Mysore Pak is that the flour will start appearing puffy and the color will change into golden brown. Now depending upon the requirement a plate is greased for setting the Mysore Pak. Finally the piping hot mixture is poured into the plate and tapped so that it becomes even. Within 5-10 minutes Mysore pak gets frigid. Now it is cut into pieces according to the required shapes and yummy mouth watering Mysore Pak is ready. It has to be stored in an air tight container.